As I love outdoor sports like rock climbing, skiing, mountaineering I was looking forward to the Banff Mountain Film Festival coming to Beijing. A friend rock climber and mountaineer has opened a bar and cafe down the Wudaoying hutong where my bike shop is. It is called the „Together Cafe“. Inside there are many outdoor magazines and pictures from his expeditions to Tibet. The film festival started yesterday and I actually wanted to go but never checked the schedule. When I finally looked yesterday afternoon I was shocked to see that the first movie screening session was already over as it had started at 9am and the second one was already on going. So we could only go today and went for the early starting screening. There were quite some people even though I think there were only 3 foreigners. We saw a movie called „Cliff Note“ (悬崖笔记) about cliff diving in a canyon. Amazing was a movie about free solo rock climbing and then base jumping from the top. Or just base jumping when you fall during the free solo climbing. Also doing slack line balancing between peaks or cliffs without being secured and also just using the base jumping parachute in case you fall. 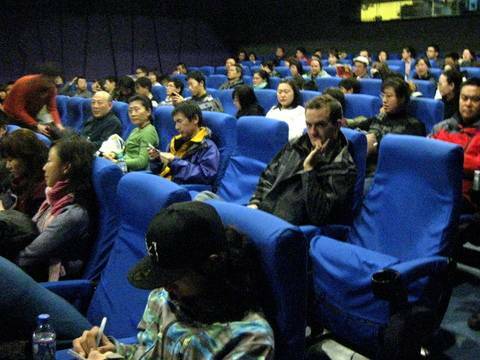 I enjoyed the movie called „Searching for the coast Wolves“ (寻狼记). It was the very touching story of the former cross country running champion and biologist Gudrun Pflueger from Austria about her research about the coast wolves in Western Canada. She actually had an encounter with the coast wolves that seem not to have any bad experience with human beings in the past centuries and therefore did not see any threat in Gudrun and just played around her. 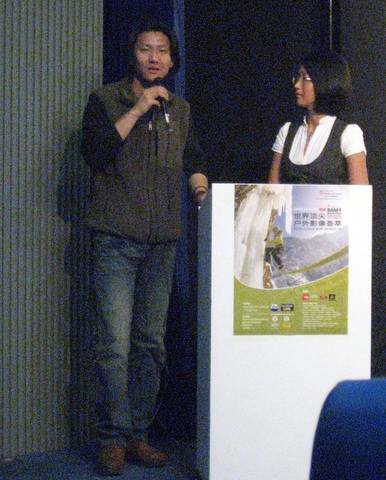 The Chinese movie maker Ricard was asked to come up and to talk about his outdoor movies. One is called „Dragon Breath“. On the back of the DVD is reads (including the typos) the following: „During the Spring Fesitaval, four Chinese top climbers came to Shuangqiao Gully, located in Mt Siguniang in Sichuan, to challenge the Dragon Breath, the hardest route in the vally. This documentary record their climbing and life in the vally.“ They only screened trailers of 4 of his movies and of course we recognized some of our Chinese outdoor and climbing friends in these movies. After that we met our friend Nicolas Favard who is a French jewelry maker. He does very beautiful jewelry and each piece is unique. He designs pieces of art for his customers. If you are in Beijing I recommend you drop by his boutique in Sanlitun in the Nali Patio on the 3rd floor. This entry was posted on Sonntag, Januar 17th, 2010 at 22:51 and is filed under Beijing, China, Climbing, Outdoors. You can follow any responses to this entry through the RSS 2.0 feed. Both comments and pings are currently closed.